I must say that I am much saddened after having read the lengthy posts on Purgatory. (For the record, I do not believe that the Western definition is completely incompatible with that of the East. It is the same mystery looked at from very different, yet complimentary angles). What saddens me the most, however, is the "I hate Rome" attitude evident in many of the posts. As a Byzantine Catholic catechist, I am deeply in love with our faith and traditions. Unfortunately, I fear that Byzantine Catholicism will soon die on this continent unless certain attitudes change. Why? The anti-Roman attitude of many in the Byzantine Catholic Church is driving legions of our faithful to become Orthodox. Not that there is anything "bad" about being Orthodox, but that our own expression of the faith... Byzantine CATHOLICISM... is going to vanish. When speaking with older Byzantine Catholics, the difference in attitude is striking. The older members of my parish LOVE being Catholic. They are thankful for our communion with Rome, which hasn't always been the easiest of unions. But they recognize that any marriage requires work, and that unity with Rome is something worth striving to maintain. Unfortunately many middle-aged Byzantine Catholics, perhaps conditioned by various experiences characteristic of their generation, have adopted an all-around "Rome is EViL attitude." In many ways this does not differ from the anti-Rome attitude prevelant in Roman Catholic dissident groups, such as "We Are the Church" and "Call to Action." While the particulars are very different, it is the same old Rome-bashing attitude. This is not to deny that Rome has made mistakes in the past, and can do so in the future. Nonetheless, communion with Rome has been a blessing to our Church, for which I am eternally grateful. But should we be surprised when we have almost no priestly vocations when we are constantly chanting, "Rome is EViL, the Orthodox are pure and righteous"? Should we not expect legions of our faithful to become Orthodox when we teach our young how corrupt Rome is, and how pristine and glorious the Orthodox are? Please prayerfully ponder what I am saying. Are we not cutting our own throats? Certainly, our traditions have not always been respected by the Latins. But we must educate them, and they are starting to listen. We have the potential to be a leaven to the ENTIRE Catholic Church, especially in matters of Liturgy. Please, brothers and sisters, do not ruin this opportunity by driving our faithful out of communion with Rome. I realize that for writing this message, I will receive dozens of angry and critical replies. If that is the price for speaking the truth, I am willing to pay it. But please PRAY before you respond. I too am a brother in Christ, and am deeply in love with our Byzantine Catholic Church. I am also only 21 years of age, and probably speak for countless other Byzantine Catholics of my generation. I hope you read my post under Byzantine News. Yes, it is difficult to watch such goings on by both parts. There is certainly enough blood spilt on both sides, the 7th? Crusade sacking Constantenopole, the 50 thousand dead in consentration camps in Russia, etc.,the celebicy war here in the USA. As Christians we have often stabbed ourselves in the foot. As we come into the 3rd Millinium, we need to work hard to become the Christians God intends for us to be. We must pray, and witness with our lives. We must make good happen. Please go back and read all the messages again. I don't believe you will find any that promote hatred of Rome. What you will find is disapproval of the idea held by many Roman Catholics (and even many Byzantines!) that Roman / Latin theology is superior to Byzantine and, perhaps, a frustration with those Roman Catholics who will not recognize Byzantine theology as equal to the Roman. In all the posts - especially the ones on Purgatory - we Byzantines are consistently clear about our respect for the Latin theology on this and other issues. We are equally clear that good Latin theology does not equate good Byzantine theology. How is this Rome-bashing? How do you perceive this to be driving people into Orthodoxy? I am willing to consider your points but only if they are backed up by evidence. In my 20+ years of active involvement in parish education I have yet to see it. This is a very curious statement since Byzantine Catholics are Orthodox Christians in communion with Rome. There should be no difference between the Catholic and Orthodox expression of Byzantine Christianity. We lost much of our Byzantine theology and practice during our communion with Rome. But, during the years since Vatican II, we have recovered much. Currently, the fastest growing Byzantine parishes are the ones who are the most faithful to authentic Byzantine Tradition and customs. This does not mean that we need to force the more Latinized parishes to become Byzantine overnight. Pastoral accommodation is necessary and good education (of both our Byzantine people and our brothers and sisters in the Roman Catholic Church) is necessary as we return to a more authentic expression of Byzantine faith and practice. Please list specific references on this bulletin board by any Byzantine Catholic promoting a break with Rome. You won't find a single one. Those Byzantines posting here are clearly stating that we Byzantines should only be who we are: Byzantine - and not Roman - Catholics. Please also be very careful about accusing others of not showing Christian charity. When you re-read the posts be careful to distinguish between the frustration with the "Latin theology is superior" attitude and what you consider to be "Rome-bashing". There is huge difference. You do, however, raise an interesting and excellent point worthy of discussion. Prior generations were raised with the attitude that "we are Catholic first - Byzantine second". This is totally false and has contributed to the fact that most people who should be Byzantine Catholic now worship in Roman Catholic Churches. Byzantine and Catholic cannot be separated. Byzantine Catholics must be faithful to Byzantium before we can be considered to be good Catholics. As a Byzantine Catholic priest of 14 years, I have found that it is much more likely that a poorly instructed Byzantine Catholic will leave the Church for the local Roman Catholic Church, than an Orthodox Church. 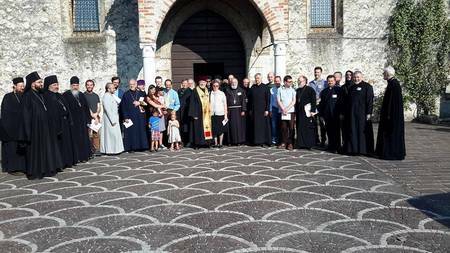 In my own experience I must meet 100 former Byzantines in Roman parishes, for each one I have met in Orthodox parishes. Intermarriage, attendance in Roman Catholic schools, and just plain laziness all contribute to this problem. >The reality is that RCs DON'T view the >Orthodox Churches as 'sister churches' >except on paper. Yet another example of >Roman Triumphalism. >If I had a friend who was leaning toward >Orthodoxy, I'd tell him/her to go for it. >While the EOs may have their jurisdictional >problems, esp. in the US, they have a >strong sense of historicity and communion, >something that Rome seems to have forgotten. >Pluralism NEVER was part of the Roman >agenda. Conformity, yes, but pluralism? Ha! >A lot of fancy words, but obviously >duplicitious. >THEY think that WE think about canon laws >the way THEY do. We don't. >The 'traditional' compilation of 'canons' >in the Great Church (Constantinople) is >known as "The Rudder". It's guidance, not >the bar association. >And they have lots more canon lawyers than >we do; and they're organized into societies >and organizations. And they push their >agenda as lawyers, not as pastors. And >we've got to watch them like hawks. >By the by, what do you call 1,000 lawyers >at the bottom of a lake? I agree entirely that Byzantine theology is different than Roman theology, and that Byzantine theology should not be subject to exclusively Latin expressions. Personally, I feel much more at home in Byzantine theology, and find that too much Latin theology can make a person neurotic. Likewise, the spirituality of the East, which I have been studying since I was seventeen, has touched me in ways that Latin spirituality could never begin to. If I had not studied the Philokalia and practiced the Jesus prayer, I would not be the man that I am today. And of course, the Divine Liturgy preserves riches that the Roman rite is sadly lacking. >Byzantine Catholics are Orthodox Christians >in communion with Rome. There should be no >difference between the Catholic and >Orthodox expression of Byzantine >Christianity. With the greatest respect and charity, I must ask this: why should we not become Orthodox? If there is no difference, Orthodoxy seems to be the more appealing route. 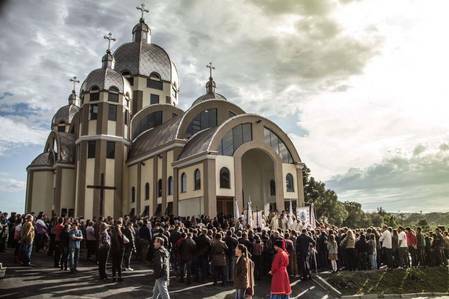 Orthodox Christians do not face the countless obstacles that we do in the Byzantine Catholic Church. I personally have strongly considered becoming Orthodox in the past. The only things that have kept me from doing so are the claims of the Papacy, which I now, after much struggling, believe to be true. The claim of Papal infallibility is hard to accept, as it seems to fly in the face of human reason. But with much prayer and historical research, I have come to regard the Papacy as a profound gift of God to His Bride, the Church. >Byzantine and Catholic cannot be separated. >Byzantine Catholics must be faithful to >Byzantium before we can be considered to be >good Catholics. I agree ENTIRELY! We have so much to offer the Roman Catholics, and I hope to make it my mission in life to share the wealth. >I have found that it is much more likely >that a poorly instructed Byzantine Catholic >will leave the Church for the local Roman >Catholic Church, than an Orthodox Church. You are right. A large number, who are poorly instructed, do start attending Roman Rite Parishes. This breaks my heart. I only speak of Byzantine Catholics becoming Orthodox due to some personal experiences. A former pastor in my parish left to become an Orthodox layman. Likewise, a former pastor in a parish near my parents house left to become an Orthodox priest, and was "re-ordained" to the priesthood, which gravely disturbed me. A seminarian from my current parish completed his studies at Cyril and Methodius Byzantine Catholic seminary, and then... only weeks before his ordination, left to become an Orthodox priest. This broke the heart of my pastor, who for thirty years prayed that God would call a vocation to the priesthood from his parish. I, at the prompting of one my former pastors, was very tempted to become Orthodox. As a young Byzantine Catholic, constant complaints against Rome can make you want to leave the Church. But you are right, Father. The overwhelming majority does become Roman Catholic, largely due to poor instruction. As a catechist in my parish, I am trying to overcome this trend by carefully instructing my students in the beauty and complexities of the Divine Liturgy. I am also working on an essay on the Divine Liturgy, which I hope to have published in a Roman Catholic journal. Thank you for your prayers, Father. They are much needed. The Balamand Agreement (a working document of the Orthodox/Catholic dialogue) clearly states that one's conscience is to be respected in choosing to be Catholic or Orthodox and in no way does this jeopardizes one's salvation. Prodigal Son - the poster which you quote - does not seem to be advocating a wholesale pushing of people from the Byzantine Catholic Church into Orthodoxy as you claimed in an earlier post. He clearly is talking about a single Roman Catholic who would apparently have specific issues that he or she could not resolve within Roman Catholicism. Byzantine Catholics often ask of the Roman Catholics and Protestants who come into our Church: "Are you fleeing or seeking?" While we welcome all who come it is ultimately those who are seeking that will find. >>The 'traditional' compilation of 'canons' in the Great Church (Constantinople) is known as "The Rudder". It's guidance, not the bar association. And they have lots more canon lawyers than we do; and they're organized into societies and organizations. And they push their agenda as lawyers, not as pastors. And we've got to watch them like hawks. By the by, what do you call 1,000 lawyers at the bottom of a lake? A good start. Nor here.... I see frustration with the lack of respect Byzantine traditions receive from Roman Catholics but not anti-Romanism. Just look at the new Code of Canons of the Eastern Churches - well written and concise but it was written for us, not by us. It contains much good and provides order but reflects the concepts of the Latin Church, not the Byzantine. This quote may stir up a hatred for canon lawyers but that is certainly not a bad thing. Byzantines tend to view canon lawyers as kinfolk of ambulance chasing lawyers. No one here has discussed this to any great length. All the comments by the Byzantines have simply been "let us be Byzantine" with a push not to be treated as Roman Catholics. Provide quotes, please. The spirit of posts on this forum indicate that we Byzantines want to be left alone and that the West needs a good dose of all things Eastern to balance the legalistic tendency of the Latins. Provide quotes of your accusations, please. Byzantines (including myself) have expressed concern that the current definition of the role of Peter is not the best definition (at best) or flawed (at worst). Since John Paul II has asked the Orthodox to help him better define his role for the next millennium any suggestions or discussions along these lines are perfectly appropriate. In matters of salvation - agreed. The consistent witness of the Church - including many recent teachings of Pope John Paul II - agree with this statement. But this statement cannot be construed as pushing people into Orthodoxy. Indeed, it invites a discussion of the role of Peter - exactly what the Holy Father has called for. Your conclusion is illogical and based upon false and inaccurate hypotheses. 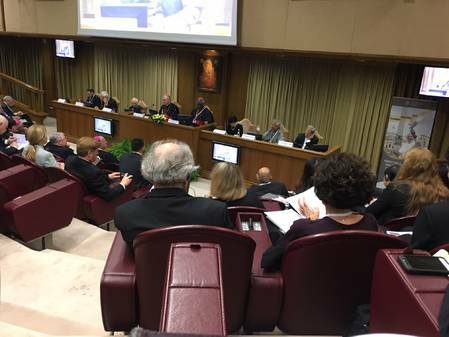 No one here has stated that the Western ecclesiology is false or incompatible. It does need adjustment in order to allow for the existence and equality of Byzantine ecclesiology. We already are Orthodox. We stay in communion with Peter because, despite the troubles involved, communion with Peter is something most Byzantines would not and should not give up. The fact that the older brother is being unfair is not reason to cast him out of the family or to pick up and leave. It is all the more reason to try to work with him and redefine his role in a manner acceptable to both the first millennium and the third. 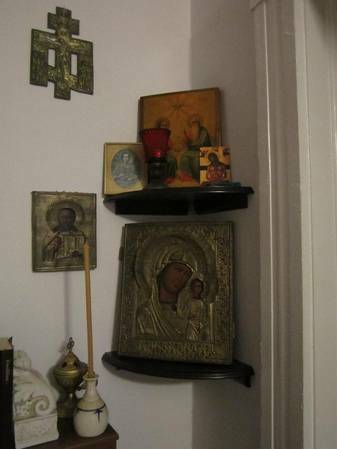 Because of the events leading up to 1054 the Orthodox have been uncomfortable living in the same household but they still are members of the same family living next store. But the Orthodox Christians (not in communion with Peter) do face other great obstacles. They do not have the visible rallying point provided by Peter. The lack of communion with Peter has contributed to disunity. Even Fr. Alexander Schememman, an Orthodox theologian of blessed memory, expressed the issues arising from the lack of a strong central figure. Adaptation of a form of the Byzantine model of the Trinity that I posted on another thread would solve all these issues. Papal infallibility is based in the Church in Council. Orthodox would not argue that against the infallibility of the pope presiding over the Church in Council. It is the possibility of him acting as a single entity that creates problems. Not knowing their reasons I can't comment on their actions. It was wrong for the one priest to submit to re-ordination - it sounds like he has entered one of the flaky Orthodox jurisdictions. I sincerely doubt that these good men were driven to Orthodoxy by honest discussions of the issues that we face as Byzantine Catholics. It was probably a lack of action on our Church to address real issues. Antony, you obviously love Christ and your Church. Why not start exploring a possible vocation to the priesthood? The seminary in Pittsburgh has numerous "Come and See" weekends to help men discern their vocation. 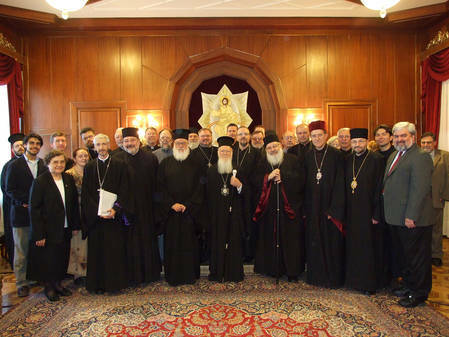 "How has the Melkite Church viewed the problem of Uniatism since Vatican II? authority, P. Khairallah, in the United States of America. [Note: The Rev. Dr.
nontheless presented ideas shared by certain Melkite bishops and theologians. Catholicism in such a way as to maintain the best of both traditions. Roman Catholic community of faith and worship, [Note: Note the words of J.
Fr Serge's work is well worth obtaining for those who want to understand Eastern Catholics and their relationship with Rome. It's possible that I did. I am a sinner, after all. >The spirit of posts >on this forum indicate that we Byzantines >want to be left alone and that the West >needs a good dose of all things Eastern to >balance the legalistic tendency of the >Latins. Okay. I'll try and calm down. Perhaps I was mistaken. >I sincerely doubt that these good men were >driven to Orthodoxy by honest discussions >of the issues that we face as Byzantine >Catholics. It was probably a lack of action >on our Church to address real issues. You are probably right on this point. There can be a great deal of proper frustration. Especially when our own traditions are not respected. However, when venting our frustration, it should be stated (when prudent) that we don't want to break our union with Rome. I am only saying this because as a teenager I heard lots of anti-Roman banter, and not a great deal of support for our communion with Rome. >It was wrong for the one priest to submit >to re-ordination - it sounds like he has >entered one of the flaky Orthodox >jurisdictions. It really troubled me when he was re-ordained, because it insinuated that those in his parish hadn't received valid sacraments. Perhaps someone on here can fill us in as to which Orthodox jurisdictions re-ordain Byzantine Catholic and Roman Catholic priests? An Antiochan Orthodox priest told my friend that they re-chrismate and re-ordain all Catholic priests. >Antony, you obviously love Christ and your >Church. Why not start exploring a possible >vocation to the priesthood? The seminary in >Pittsburgh has numerous "Come and See" >weekends to help men discern their >vocation. That's a good idea. I may be called to the priesthood, but I am not certain. A "Come and See" weekend may be able to help. I'll talk to my pastor about this. A close friend of mine went to the last Come and See weekend at Cyril and Methodius, and absolutely loved it. He plans on entering the Seminary this fall! I have several other friends who want to visit the seminary as well. This is really great, because the Archeparchy of Pittsburgh is badly hurting for priests. Almost every priest that I know is the pastor of two parishes, which keeps them constantly on the move. If I seemed a bit overly concerned in the previous posts, it was because I wasn't certain of where you and other posters are coming from. I was afraid that a break with Rome was brewing. I shouldn't have been so quick to jump to conclusions. But it sounds to me that you, and others, are as thankful for our communion with Rome as I am. I apologize for assuming too much. The Roman Catholics have a lot to learn from us, and I am finding many of them very responsive. The young men and women of the Roman Catholic Church are often troubled by the very real loss of tradition that they have suffered in their own Church. Guitars, happy clouds, and denials of the Eucharist are common fare in some unfortunate Roman Catholic parishes. Those who crave tradition are pleasantly surprised by our Church, and are developing a great respect for our heritage. Perhaps the crisis in the Roman Catholic Church is the opportunity for which we have been waiting, to be a guiding light to the whole Catholic Church. I often reflect on how we Byzantine Catholics live on the "faultline" between two ecclesial tectonic plates. This is our privilege and our dilemma. Discussions like this thread are vital to our vocation. The eager search for peace, the pain of being in a Church and separated from a Church, these realities MUST be agonized over. Only thus can we communicate to the too-comfortably divided larger Churches what their divisions really look like, and what they really mean. We are on the margin. But where there are tears in the fabric, those margins matter.